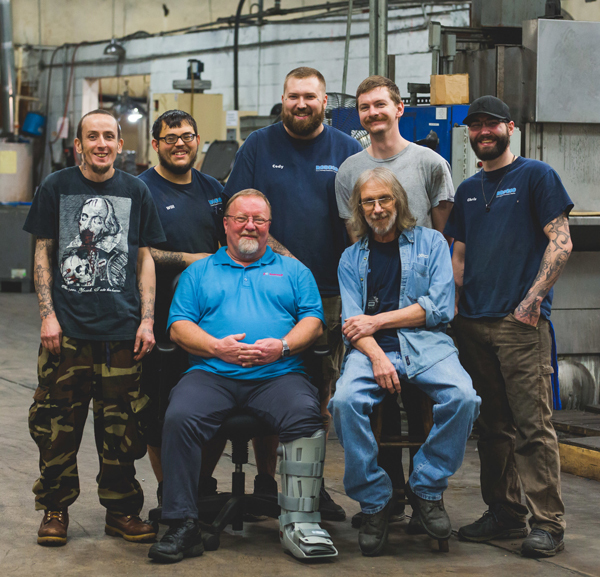 From the very beginning, our mission has always been to be a results-oriented team providing the best solutions to meet the needs of manufacturers. Whether your goal is to extend equipment life, produce a better finish, develop a more efficient process or simply to provide our customers with information you need to make better business decisions, our experienced staff delivers what you need. Rodeco was founded in 1960 by Robert Johannesen in Sanford, NC. The company was then purchased by current owner Bill Murphy and his partner, Jim Borrell in 1982. Rodeco was outgrowing it's space in just a few years so in 1986, Jim and Bill moved Rodeco to a 9,000 square-foot location, also in Sanford, where the company remains in operation today. In 1994, a 4,000 square-foot addition was completed and then another 13,000 square-foot was added in 2004, resulting in their current 26,000 square-foot facility. In 2000, Bill Murphy bought Jim Borrell’s share of ownership, making him the sole proprietor of Rodeco. In 2009, Bill's son Ryan took over the day-to-day operations. The Ryans bring a unique excitement and passion for American manufacturing to their jobs. They both believe that helping to improve domestic manufacturing efforts results in more profits, more jobs, and less outsourcing. It is their desire to strengthen the US manufacturing industry—and the country along with it—that motivates them every day. Manufacturing companies throughout the Southeast come to Rodeco with product samples and specific washing or finishing needs ranging from deburring to burnishing, blast cleaning, degreasing, and more. After careful consideration of the client’s requirements, Rodeco’s experienced staff delivers a range of options for solutions, allowing the client to choose the one which best meets their needs. Once the ideal product finishing results are pinpointed, the expert engineering staff at Rodeco runs cost analyses on the client’s various options for scaling up the selected processes. The staff at Rodeco specializes in determining which option represents the most cost-effective solution for the client’s specific product finishing requirements. Call us today at 877-781-0834 or contact us to learn more about our products and services, and to discover all of the ways that we at Rodeco can serve your needs! Rodeco is a dedicated provider of washing, abrasive blasting, soda blasting equipment, and vibratory finishing equipment, supplies, maintenance, services, and more located in Sanford, NC serving manufacturing companies throughout the Southeast. "I just wanted to take a moment to say "THANK YOU" to both of you and to your staff for the superior (customer) service and product coming from your company. I am very big on business relationships and partnerships and I am so glad the Rodeco Company is part of our family/ team. Although we have only placed 2-3 orders with your company, each experience has been nothing short of professional. phenomenal and delightful. Such customer service has become almost extinct these days and it's refreshing to know that in some parts of corporate America such customer service is still alive and well. Please know we will HIGHLY recommend your company when asked and have no problem being an unpaid spokesperson for your company as well." LET OUR KNOWLEDGEBASE OF PEOPLE HELP YOU SOLVE YOUR ISSUE.